Significantly different than conventional agriculture, organic food production is one of the fastest growing segments of agriculture, with retail sales increasing by 20 percent annually since 1991. In many ways, Washington State has been a leader in this burgeoning new industry. This revolutionary new major is the first of its kind to be offered in the United States. Students in this major take a diverse array of courses in the natural, environmental, economic and social sciences, as well as a number of courses focused on organic production practices. Students wanting a hands-on degree experience thrive in the organic major. 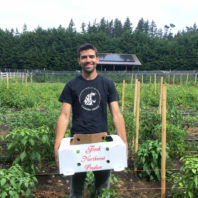 WSU has a four-acre, certified organic teaching farm, which is currently in the process of expanding to become a 17-acre, multi-disciplinary organic farming operation and community center. This farm is an invaluable tool where students learn to produce certified organic vegetables, fruit, herbs, and flowers that they distribute through local food banks, on-campus food service, a 100-member community supported agriculture (CSA), and a local farmers’ market. The College of Agricultural, Human, and Natural Resource Sciences majors to take certain prerequisite courses before certifying into the degree program. 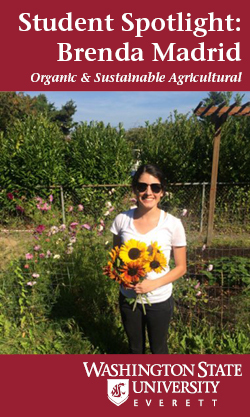 – Select “WSU Everett” as your campus and “Organic and Sustainable Agriculture” as your academic interest. 3. The academic coordinator will contact you and help you apply for certification into the Organic Agriculture Systems program. 4. Pay the WSU tuition deposit, which confirms acceptance of your admission offer. NOTE: This deposit is nonrefundable; pay the deposit only after you are certified into the Agricultural and Food Systems program.